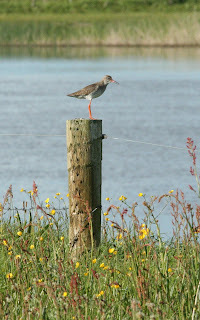 The 2012 wader breeding season is now well underway, despite the cold weather. The birds started to arrive back to their breeding grounds around mid February, pair up and establish territories. Nesting seems to be late this year though and although some birds are very obviously on eggs, so far only one pair of Redshank have hatched chicks. The high winds and cold weather has possibly delayed breeding a little. The weathers also been hampering our efforts. Survey work is difficult and not very accurate in such strong winds and some boat crossings are just not possible, site visits having to be abandoned. Not at all midlands weather! The predator proof fence on Inishee Island has been on for the last month and as always is working like a dream. A big thank you to this year’s volunteers. This week’s count tuned up seven pairs of Lapwing, approximately 20 Redshank pairs, one, possibly two pairs of Curlew and numerous snipe. Since its erection in 2009 the population has increased each year, this year being no exception. Once dubbed the island of death by Fieldworkers because depredation rates were so high, it couldn’t be more alive today. Lapwing with their characteristic call of an old fashioned radio being tuned, tumble and dive in display flight overhead. The meadows watchdog, the Redshank stand guard on the fence posts, alerting all of our approach before ganging up and performing a noise high speed fly-by. The Curlew must be on eggs, instead of both performing their usual gurgling call and display flight, one now sneaks off from their nesting area in low flight and without a sound. A third bird is causing confusion, it remains to be seen whether it too is breeding on the island – fingers crossed. The May Bird - Whimbrel are back in the Callows all of a sudden, with a flock of 20 birds feeding on the island. Skylark and Meadow Pipits practically explode from every area of ground and the sky fills with their parachute flight. Definitely not the island of death anymore!